In a previous entry, I talked about in detail a possible design flaw with the chimney extension. Because of that, I devised a really cheap (no-cost if you’re resourceful enough), yet effective solution to prevent debris from falling into the chimney extension. This is debris that eventually will cause the quick build-up of soot inside the chimney which blocks the exit of smoke. The filter we made in that entry was very effective but only to a certain extent. After a while, soot will buildup on the filter itself, depositing into the diamond shaped holes or gaps in the screen. The longer the usage of the grill, the more soot covers the holes of the screen filter. This restricts free airflow and quick passage of smoke. Cleaning of the screen filter is tedious. One way to clean the holes is with a scraper type tool, but because of the number of holes or vents, it will take quite a while to clean it totally. Cleaning of the screen filter is messy and may be unsafe. When cleaning the filter, there is always the danger of getting skin cuts with the screen spikes. To have a filter with bigger holes or air vents yet still able to filter out common rubbish. To have a filter that will be easier to clean. I knew there’s no way out of the soot formation because soot is a natural by-product of the smoke. But I wanted a cleaning method simple enough where I won’t need a scraper or any other extra cleaning tool. Soot gunk will form on ALL parts of the filter. So, the lesser number of parts that comprise it will mean lesser the number of parts to clean. And this translates to shorter cleaning time. I initially thought of getting a bigger hole screen. But that would probably mean buying and having so much leftover screen that I won’t need. This is of course wasteful and a non-frugal solution. So, why not build one instead? Aha, a D.I.Y. (Do-It-Yourself) project! Old wire hanger, preferably with no nicks or rust. With a cutter, splice off the plastic or rubber insulation from the wire hanger and the solid strand wire. 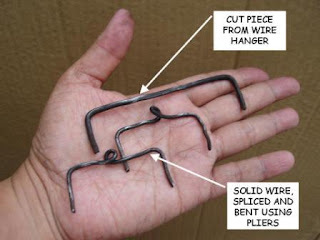 With a metal hacksaw, cut a 6-inch piece from a wire hanger. Be sure the piece is straight. This will be the spine or “backbone” of the new filter. With the pliers, cut 2 pieces of the solid strand wire, both of them 4” long. With a vise-grip and a pair of pliers, bend 1” at both ends of the wire hanger piece. With a vise-grip and a pair of pliers, bend the solid strand wire so it looks like a single pair of legs as shown below. This is a bit difficult and you’ll need the spine as a placeholder where you’ll “wrap around” the solid wire. Note though that the middle hole should not be too tight but could let the spine pass easily through. When all 3 components (spine and 2 leg pairs) are done, assemble them together so they all form into a “spider” figure as shown below. When fully assembled, mount the new spider filter as you did with the old screen filter – like a cap on the chimney extension. The photo below shows the spider filter in use with the legs clipped on to the sides of the chimney extension. Get a Grill for Free!